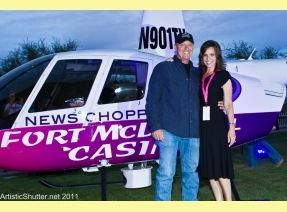 For us, they’re our second featured “Power Couple” on Arizona Farm Bureau’s Celebrity Q&A (Our first couple was Kellie and Kirby Chambliss). Well, think about it. Bruce and Lisa Haffner are both local media celebrities with each one having their own successful media career; they are raising a family and having fun while they’re at it. Or, at least let’s call them the dynamic duo! Bruce Haffner runs his own business he launched in 2011 called Chopperguy providing top quality aviation video production and news coverage. Given his news experience for TV3, he is back in the air for the “Good Morning Arizona” newscast and his company is busy shooting aerials for production companies, ad agencies and he already has his first movie credit on the big screen. Bruce and Lisa have four children and can be found skiing, snowboarding, dirt riding, camping and playing sports. What created your passion for food? Both Bruce’s Mom and my Mom are great cooks, so we learned our skills from our Mothers. Bruce’s Mom and his sister were huge bakers…so that’s where Bruce got his sweet tooth. My Mom and Dad would spend hours making homemade Italian sauce and taught me how to make sauce and meatballs when I was a teen. So now we’re a perfect team, I’ve learned incredible cooking techniques from the amazing top notch Chefs who come on Your Life A to Z and Bruce gets to eat new and exciting dishes every night! Truthfully, at home! But if I had to pick just one place, that’s really tough….If we want to eat and not feel guilty, we go to True Food…Good healthy food…The indulgence? Probably, the sports bar in our neighborhood where our kids beg us to go and we usually run in to friends there before or after a baseball game…. Anything chocolate for Bruce, like chocolate mousse, anything fruity for me, like homemade fruit pies or lemon cupcakes! Oh, great, now I’m craving one!!! When it’s cold out, I love to make a big pot of homemade Italian sauce!!! Then I invite all our friends over to eat it up with yummy bread and good Italian wine!!! In the summer, I love salmon cooked on a cedar plank with a drizzle of honey over it…Bruce is still grilling on our 25-year-old Weber and he won’t grill on anything else!!!! Must have garlic, Hawaiian salt that my sister sends me from Kauii, fresh ground pepper, onions, and honey. With those few good ingredients, you can make anything taste better. Oh, and butter!!! Just a little goes a long way for flavor on fish, I usually cook with Olive oil then add a dab of butter to finish it off…. How do you maintain good eating habits with a busy schedule as a busy chopper pilot? That’s easy, Lisa does the cooking!!! All I have to do is come home and eat it!!!LOL!!! Her secret is shopping for the week on Sunday, prepping meals ahead of time and cleaning and slicing fresh fruits and veggies, putting them in see through containers, so all I have to do is reach in and go…I’m lucky! I’m the guy at my kid’s baseball game with a Tupperware of salad and sliced apples! Share your thoughts about Arizona agriculture? Ever since we’ve met incredible farmers who live right in our own backyards and started going to Farmer’s markets, we’ve been hooked on buying local grown products. There are so many benefits to buying that way…the quality is better, the taste is amazing and we never waste it because it’s so good…It’s also forced us to try different produce. I used to hate Brussels sprouts, but when you buy them fresh from a local farmer, they’re delicious. Try tomatoes from the guy down the street and you’ll never go back to anything else…they actually do have “taste”…When Lisa and I shop with our local farmers, it brings us back to when we were kids and our parents had gardens. What made you decide to become a chopper pilot? I was in kindergarten and was staring out the window when I saw a helicopter land at our school. I was able to go out and meet the pilot and look inside the chopper, I was hooked! I now do the same thing for local schools and am thrilled when I see that same look of amazement from little kids. I love the freedom it gives me to see the world around me from an entirely different perspective and I’m glad I get to share that with our viewers on Good Morning Arizona! What do you think is unique to Arizona when it comes to food, restaurants and/or anything related? I think our weather dictates what we eat here…When it’s hot, heavy meals aren’t so enticing. It forces us to eat fresher and lighter and a lot of restaurants here know this and menu’s cater to that. We have so many award winning Chefs in the valley and we have come so far in the past 20 years. I think having so many great farmers that bring their produce to many of our restaurants also helps with keeping the top quality products on the menu. Mix butter, onion, soup, sour cream, and cheese. Add hash browns and mix (do not mash). Put in casserole dish and top with crushed corn flakes and dot with butter. Bake at 350 degrees for 45 minutes or until bubbly.